MSc Development Management student, Carlos Alberto Varela, explores the security crises on the Colombo-Ecuadorian border and explains why both governments need to take action to ensure peace in the coca producing and trafficking area. On December 2016 president Juan Manuel Santos was a special guest at the Oslo City Hall. He was awarded the Nobel Peace prize for – as he proudly declared – making the impossible become possible. The Colombian government that he presides had reached an agreement with the FARC, the oldest and most important belligerent group in the American continent. The long standing civil war that has decimated Colombian society for more than 60 years -he claimed: was coming to an end. The concerted process of disarm and demobilization was thought to allow the nearly seven thousand FARC militia to be “re-socialized”, not only by providing them with economic and social support, but also by allowing the FARC itself to turn into a legal political party. The good news quickly spread around the world. Now, after 60 years of conflict, this is not an easy process. The FARC has established effective political and military control over vast zones of the country, in which they monopolized the production and trade of coca, the main ingredient of cocaine. Drug trafficking has allowed the FARC and other belligerent groups like the ELN or the right-wing paramilitary forces to finance their activity -at least during the last four decades of military conflict. The FARC, together with the several irregular groups operating in Colombia, were in charge of providing the coca paste that the different international cartels operating in the region commercialize all around the globe. 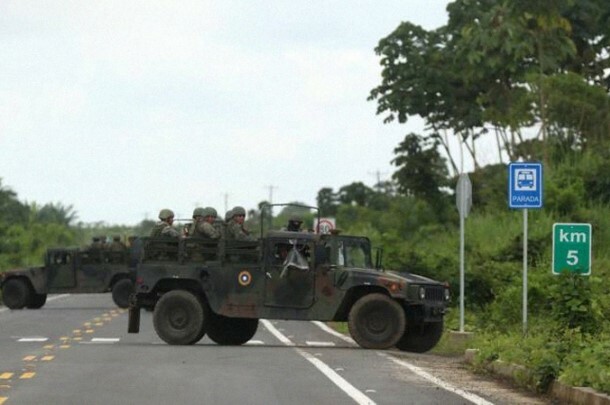 Among those, the Mexican cartels of “Sinaloa” and “Jalisco Nueva Generación” are well known for operating in the Colombo-Ecuadorian border, the zone with more coca plantations in Colombia. According to the former Ecuadorian General Attorney, Carlos Baca Mancheno, only on the border between the Colombian department of Nariño and the Ecuadorian Province of Esmeraldas there are an estimate of 67.000 hectares of coca plantations. This vast zone is of strategic importance for the Narco, not only for its direct access to the Pacific Ocean, but also due to the conditions of the terrain. From the 586 kilometres of land border the overwhelming majority is covered by a dense tropical forest, to which access is at the very best limited. The Mataje river, which make the function of natural border form the occidental flank of the Andes until its outlet in the Pacific Ocean, is widely used as a channel for transporting coca to the Pacific, and ultimately to Central and North America. According to Baca Mancheno the activity in the zone is roughly estimated to produce around 15 billion USD annually. Coca production is not only the most profitable but also the single economic activity in a region in which poverty is a rule and the presence of the state an exception. Despite the above-mentioned conditions, the area has been relatively stable until the FARC demobilisation. The presence of the FARC had effectively substituted the absence of the state in the most conflictive areas and, as bad as it sounds, the Narco activity in the region was almost totally under the control of this hierarchical, well-structured organization. In addition to its narco activity the FARC still claiming to have a “legitimate” political motive which, even if contestable, makes it fundamentally different from the dystopian criminal cartels operating elsewhere. According to the retired General and former mayor of Quito, Paco Moncayo, the hegemony of the FARC in the region had closed the doors to the evermore sophisticated and violent international drug cartels. Apparently, the FARC managed to reach and equilibrium in which they were the unique providers of the several cartels that collect, process, transport and commercialize the coca harvested in this area of the border. An aerial view from the Colombo-Ecuadorian border (near to the Pacific Ocean) shows what is presumed to be coca plantations in the Colombian side. The Ecuadorian side is mostly covered by forest, which allow drug traffickers to use it as a transit area. Photo: taken from google earth 20-06-2018. In that context, the abrupt demobilisation of the FARC created a huge vacuum of power right in one of the most conflictive and profitable areas in the American continent. The retreat of FARC militia opened a once-in-a-lifetime opportunity for the powerful Mexican cartels to capture the whole value chain of cocaine, or -at least- to sponsor local groups and FARC dissidents to become their new providers. The problem is, as it is becoming ever clearer, that this transition will be anything but peaceful. The terrorist attack against a police station in San Lorenzo-Esmeraldas, and the kidnaping of three Ecuadorian journalists in March 2018 raised all the alerts. There was a war between criminal organizations for controlling the territory, and both the civil population and the state security forces where caught in the crossfire. The Colombian and Ecuadorian governments had failed to effectively bring the state into the former FARC-controlled areas and, therefore, the vacuum of power has attracted the several criminal organizations operating around. Finally, the lack of concerted strategies for delivering economic alternatives to the population created the conditions for the Cartels to recruit, not only the FARC demobilization dissidents, but the very bulk of the impoverished rural population. Less than one month after the mediatic and unforeseen March events, the Ecuadorian president, Lenin Moreno, confirmed what many feared. The three kidnapped journalists had been mercilessly murdered by their captors, a newly created organization commanded by alias “Guacho”, an Ecuadorian-born FARC dissident that is thought to be the operator of some of the Mexican cartels operating in the region. Indisputable evidence has been sent directly to the government officers. The government officers were notoriously disconcerted: this was clearly a pattern of violence that Ecuador have not experienced before. By mid-June 2018 the number of terrorist attacks against Ecuadorian security forces had increased to five, and the very same organization that murdered the journalists admitted a new kidnapping, this time of an Ecuadorian couple. The military presence has significantly increased in the area since March, but there is clearly not -yet- a concerted strategy for providing the population with economic alternatives, nor are there serious efforts for bringing the “soft-hand” of the state to the abandoned border populations. 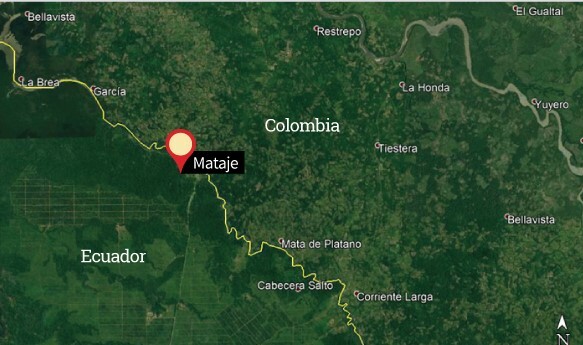 Indeed, the militarization of the zone has increased tensions to the point that a whole town, the town of Mataje-Esmeraldas, has been forced to migrate in search of refuge. The intersection between citizens and the coca business makes it difficult for the law enforcement agencies to differentiate between criminals and citizens and, as it happens, the whole population is being constantly treated as suspicious. *After declaring state of emergency in March 2018 the Ecuadorian military seized control of Mataje. The Access to the town is been heavily guarded. Photo: Diario Expreso. The Colombian peace process is undoubtedly good news, not only for Colombia but for the entire world. However, it is clear that the side effects of the FARC demobilization have been underestimated. The power vacuum created by the retreat of the FARC from the border areas must have been accompanied by a concerted effort form both the Colombian and Ecuadorian governments to retake control of the region and, importantly, to deliver new economic opportunities for the population. It is now urgent to correct past mistakes and impede the dystopian crime cartels to consolidate its dominance over both, the territory and the population. The costs of not doing it now can be incredibly high, not only for the border populations, but for the whole continent. https://www.youtube.com/watch?v=-cDoEmS2UCM&t=5754s -Hearing of the Ecuadorian General Attorney in the National Assembly, 26 of April 2018. Complete video, relevant information starts at minute 1:18:00 (in Spanish). Carlos Alberto Varela is an Ecuadorian Lawyer, currently he is finishing an MSc in Development Management at the London School of Economics. The cost of not doing nothing… replies to the entire world.